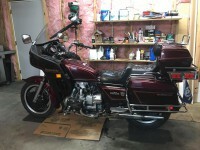 l stopped at RIVCO [Burlington WI] in August of 18...l was told that they no longer had the stand pads for the 1500...l mentioned to the lady that there were more 1500s on the road than other gwings and she told me that ''those gwing owners weren't interested in buying new products for their old bikes'' l was disappointed and somehow felt insulted! ...ln her defense, she did check in the production area and was told that there was none to be had!...HAS THE SEARCH FOR THE ALMIGHTY DOLLAR WON AGAIN? Anyone have any trouble with that 1/4" added height? There have been times I have parked on a slight angle and worry about the bike tipping over. Any I have a stock sidestand - no mod yet. I have moved the bike to find a flatter surface or pumped up the rear suspension so the bike leaned more and was less prone to tipping over. I normally run my rear suspension around 11-12 as the wife says the ride is the most comfortable there. Not that I ever noticed, but I do have relatively fresh 416 Progressive shocks in my bike, and keep them pumped up to around 30. Since I put the Austone tire on, which is a bit taller, it definitely has no problems. For any Canadians who would like one of these for their GL1800, Amazon.ca just put up a less costly supplier of same. Now $39.19 plus $16 shipping in CDN dollars from a company in Arizona called Lytle Racing. I ordered mine. This is a lot better than the $125 and $185 ones they list from a different supplier. Sorry I don't buy and totally ignore Amazon.ca . I can order cheaper from the states including shipping than buying from that site. Its not too often where I need to worry about the bike stand sinking and need to weld, glue or bolt on an expensive toe. I bought a 6"x 4" plastic plate for the toe to sit on that was designed for bike stands and the toe sat in the middle. To make my life easier I glued a super magnet ( one can use a different magnet) from a computer hard drive on the plastic plate and got a telescoping magnet for picking up nuts and bolts or tools dropped where your hands can't get at them. This way you don't have to get off your bike to pick your plate up and the plate and fold up telescoping handle can be put away in your compartment under the fake tank cover. Also bikes lack space i bought the fold up magnet telescoping handle with a LED light, no need for a flash light taking up rare space. Way way cheaper than what I have read here. JB welding that small plate was a good Idea and cheap. 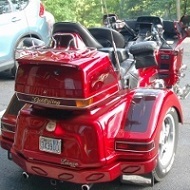 I would rather keep my collector plate bike without any custom modification if possible. That's pretty much what I used to do as well...but you have to know in advance (and REMEMBER) that you need to use it. Now I don't have to remember, or even think about it. I've had one of these Rivco pads on my 'Wing for a couple years now. I guess we tend to go to a lot of areas where while the roads are paved most of the parking isn't. Having that wide pad on the sidestand has been great. However one side effect is that I tend to do more scraping in the curves than I used to. Part of that is probably due to the fact that I also have a set of Kury floorboards, so that probably keeps the sidestand from coming up as far as it would without it. I may have to get a new one before too much longer since I've ground the current one down almost all the way to the original sidestand. I always kept a smashed pop can on the bike. worked fine. I cut a "pad" from 1/2" plywood, drilled hole, cut "ditch" or wide groove from hole to nearest edge on bottom side, tie 4 feet long piece polyethalene pink cord with it pulled tight in that groove, loop at other end, drop it, hold cord, foot scoots it under sidestand, loop placed around clutch lever area. 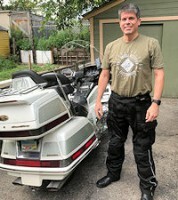 When leaving, lift up by straddling bike, pick up foot by pulling cord, wrap foot with cord and place in left pocket, kick sidestand up, ride. I can likewise, put bike on centerstand, tilt away, and slide it under on side of centerstand if parked sideways on slight grade. Oh come on. wouldn't you rather spend some hard earned money on something more expensive. What are people to think, a block of wood with a coloured cord. Seriously, that's cheaper than mine. Than again it does the job. I'll take the money saved and buy two tanks of gas. Haha … it has great value though. the bright cord looped over the clutch lever makes it unlikely for me to forget it. I did polyurethane the wood … to protect it. Now you got me to thinking, could plate bottom side with a piece of aluminum. After reading this review, I ended up purchasing this product through Amazon and was really looking forward to using it. However, when it came in, it appears the set screw was broken. It is recessed inside the unit but looks like it broke off when it was installed. There is no way for me to turn the set screw, not even to try and withdraw it. Any suggestions? 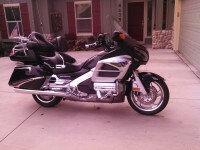 Motorcycle: 2006 1800 bought new out of the box...Now has 207K Love this bike!!!!! Companies that make products that nobody want, eventually go out of business. So yes the almighty dollar always wins. You have a couple of options as I see it. You can return the product either for a refund or a replacement. Or, you can drill out the setscrew and replace it. Or aluminum without the wood?